Clean your mushrooms and chives and cut them into 2-inch length batons. (if it's shimeji just peel them apart). Peel and slice the garlic into discs. In a fry pan, heat 1 tbsp. of sesame oil and fry the garlic until soft. Make sure it doesn't brown. Afterwards, fry the mushrooms on medium heat until you see it mildly wilting but not to the point that it's watery (by this I mean that the mushroom juices are already seeping out of the 'shrooms and on to the pan, when this happens). Toss in the chives and season the mushrooms with the seasonings and the rest of sesame oil. Stir for a minute and take it off the heat. 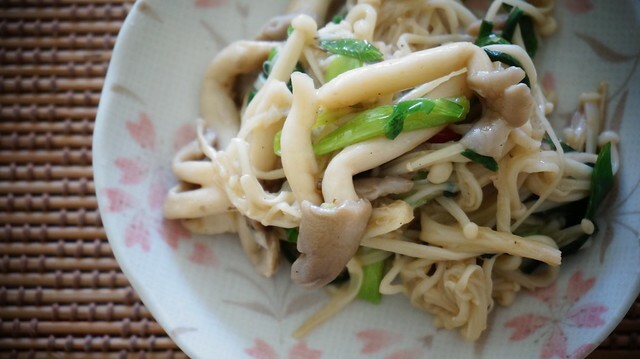 This recipe works great with eringi, shimeji, and enoki. If you use shiitake, you might cook it differently by letting the moisture out and roasting it a little. This doesn't work well with the previous three whose freshness taste better than it's roasted counterpart. Depends on how you love this, use as much as you want! I have no regrets. It’s a lovely side dish which I’ve eaten when fresh mushrooms are available. This mushroom namul is delightfully fresh. If you cook the mushrooms just right, the mushroom’s sweetness shines and contrasts with the salt and the chicken seasoning. Sometimes I add chili just to have a bit of spice. I’ve tried splashing this with maggi/knorr seasoning which was also okay but it adds unnecessary moisture to the dish which tends to overcook the mushrooms. 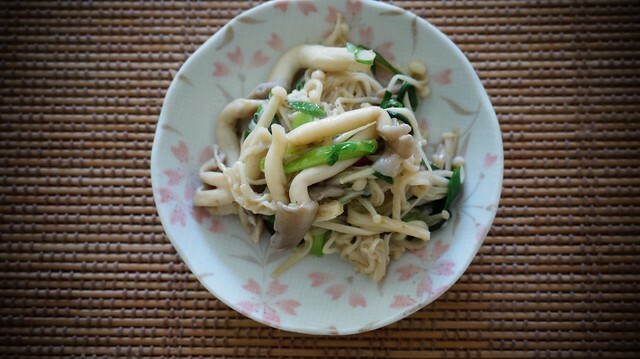 I don’t think it’s a common namul compared to the moyashi but it has the same seasonings and process which involves mildly ‘cooking’ the vegetables enough to draw their sweetness and freshness. Hence, I cannot say with great confidence that this is an authentic Korean dish. Perhaps, given my story, it’s Korean-inspired? It turned out to be an experiment with great results hence I can’t help but share. I must suggest that use fresh mushrooms and nothing else. I’ve tried it with mushrooms I’ve kept in the fridge for some while and unfortunately it had so much moisture which diluted the flavor of the mushroom and made this namul very watery. Not good eats. So, when you’ve got some fresh mushrooms, don’t pass up on a chance to try this namul!